Swim for Fun, Swim for Health, Swim for Life! 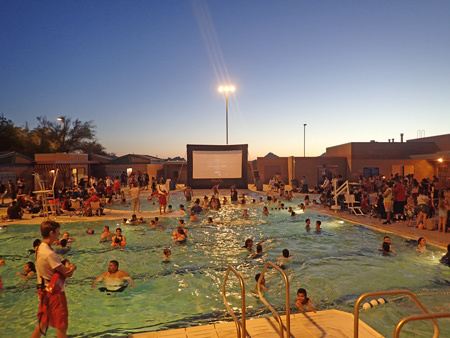 Pima County pools are open all summer long! The Pima County Natural Resources Parks and Recreation Aquatics Program offers multiple swimming programs at our 9 pool locations. Programs offered include recreational and competitive swimming for all ages as well as swimming classes and water exercise. Every pool and has its own unique schedule to meet the needs of the surrounding community. Please follow the schedule for your particular neighborhood pool. Have a great summer! ground nozzles that spray water upwards and a variety of showers that will keep you having fun all summer long! Splash pads will annually be open the third weekend in April though October 31st. Check Thad Terry Pool at Northwest YMCA page for their pool hours. * $0.50 per admission for those children who meet the low income standard. * $1.50 per admission for adults 65 years of age and older, for adults with disabilities, and for adults who meet the low income standard. 24-entry swim pass available at all pools. For additional information please call (520) 724-5171.